Find your perfect match at The Lost Dogs’ Home and for half the price! 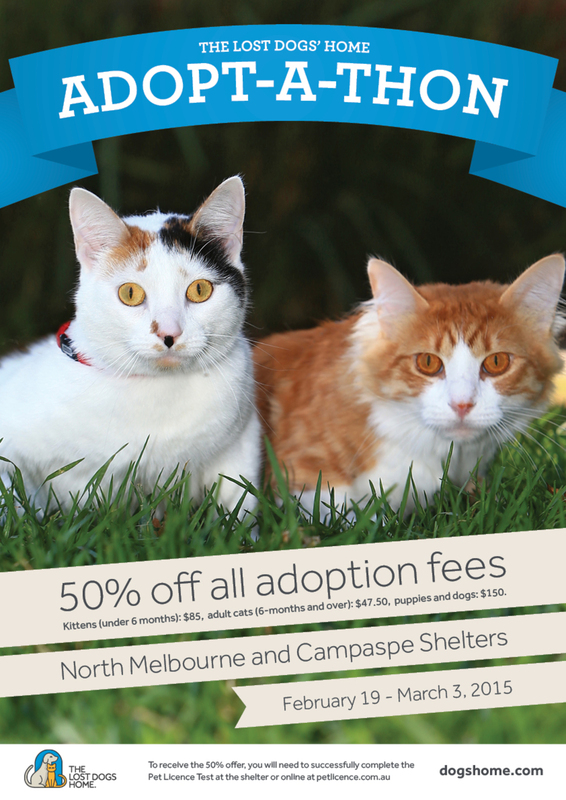 Starting today and wrapping up on March 3, we are offering 50 per cent off the adoption fee of cats, kittens, dogs and puppies at our North Melbourne and Campaspe Shelters. From outgoing dogs for active owners to couch companion cats for those who love the great indoors, potential adopters are bound to find their perfect match with the range of terrific adoption candidates seeking a home. In the spotlight are over 50 adult cats seeking a home at both shelters, including our longest adoption candidate Jaguar who despite his outgoing personality and love of affection has sadly waited 143 days. At our dog adoptions centre in North Melbourne sweet Gypsy has waited almost a month, while an energetic Stumpy Tail mix Odin at our Campaspe Shelter has waited almost two months to be adopted. Change the life of a shelter animal today! All adoption candidates come fully health checked, vaccinated, wormed, desexed and microchipped — services and treatments all valued at over $300.